When you purchase replacement parts at any authorized Kenworth dealership in North America, you will find most parts are covered by a one-year/unlimited mileage warranty. If you install a warranted part and it fails due to a defect in materials or workmanship, the part will be repaired or replaced free by any authorized Kenworth dealer. If a Kenworth dealer installed the part, it will be repaired or replaced and installed free at any Kenworth dealership. 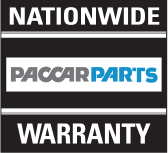 Kenworth Replacement Parts Warranty applies to most parts sourced through PACCAR Parts. Certain limitations and exceptions apply. See your Kenworth dealer for details.